Gajia, Bhujia, Jhuribhaja (Crisp and Savoury Snack), are very tasty and appetizing foods for almost everyone. The demand of these foods are in everywhere line Cinema halls, Park, Malls and also in home. With the machine you may start your own Small Business. The main raw material to make these foods is powdered pulse (besan). First you have to make paste of powdered pulse (besan). You need dies of various sizes to make these food products. Now you have to pour the paste in the hopper of the machine and the machine will make Gajia, Bhujia, Jhuribhaja (Crisp and Savoury Snack) etc. now you have to put these foods in pot. Now it needs Oil Extractor Machine to extract extra oil. You may mix spice with Mixing Machine and mix it with these foods. At last you have to pack these foods and sell it in the market. It needs 1 hp motor and 220 to 440 volts to operate the machine. The price of the machine with 1 hp motor is approximately Rs. 32000. The price of the Oil Extractor Machine is approximately Rs. 20000. The price of the Mixing Machine is approximately Rs. 15000. 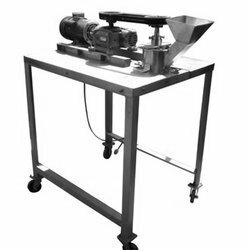 You can find many companies manufacturing a wide range of Gajia, Bhujia, Jhuribhaja (Crisp and Savoury Snack) Making Machine.